This article is about the Player. For the Coe's Quest Character, see Roamin (Coe's Quest). Roamin is a regular Player of URealms Live. 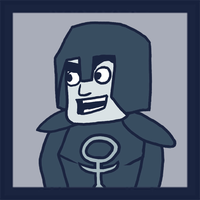 He has been a part of the URealms community and show since the very beginning and is a long time personal friend of Rob. Roamin's puppet avatar is an adaptation of a character from the original Unforgotten Realms named after him. Roamin the Paladin was an inside joke between Rob and Roamin from back when they played Dark Age of Camelot. Roamin, playing a Cleric (not paladin), got himself lost in a new player dungeon for over 20 minutes, which is why the character of Roamin the Paladin is often portrayed as a bumbling idiot. Roamin has been a friend of Rob's for a long time, and has taken part in many of Rob's earlier projects such as Roleplay and Two Player. Roamin is notable for having extremely bad rolls, which he blames on utilizing all of his luck when he and Rob played Keiba Eight Special. Roamin's last roll of the first season was rolling a 1, killing the character he rolled for. This page was last modified on 28 September 2018, at 11:45.